Ireland is an ancient and beautiful country, and is of interest both from a historical perspective and for the ancestry that form the roots of many in the United States. From its bustling cities to the miles of quaint countryside, rolling green hills, towering castles, and rugged shoreline, there is almost no end to the variety of scenic, historic and cultural attractions to visit. Dublin is the largest city in Ireland. Attractions here include Trinity College which has among in collections the Book of Kells, Dublin Castle from which British rule in Ireland was exercised for over 700 years, and the well-known St. Patrick’s Cathedral. Tourists can visit many other locations here such as the General Post Office on O’Connell St. which was the site of the Easter Rising in 1916, the Guinness factory, and Ireland’s National Museum and National Gallery. Smaller cities have much to offer and all possess their own charm. Galway is the location of the Galway Cathedral, the Galway Races, and many festivals throughout the year. Waterford is a wonderful port town where visitors may want to spend some time in the Waterford Crystal Visitor’s Center. Wexford, Limerick and Derry all have attractions of significant Irish historic and cultural interest as well. There are numerous small, fascinating towns and villages to stop in to shop, visit a pub or two, or look up an ancestor who might have emigrated from Ireland long ago. Some of these include popular Killarney, picturesque Adare, and the breathtaking village of Doolin located along Ireland’s sea-tossed western coast. Traditional historical attractions are popular as well, such as the 5,000 year old monument in Newgrange, the remnants of towers and the castle on the Rock of Cashel, and Blarney Castle and its famous Blarney Stone. 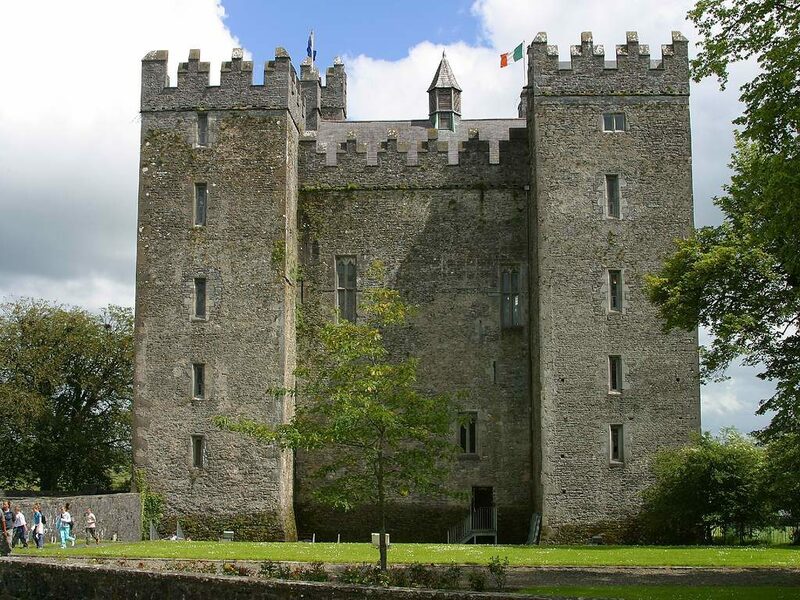 Bunratty Castle and Folk Park which includes the notable 700 year old castle as well as a reconstructed village of traditional homes and shops, is a popular attraction, too. There are, of course, many others. Traveling throughout Ireland, it is nearly impossible to avoid the many natural wonders to be enjoyed. The mountainous Connemara National Park, the flat and rocky Burren, the spectacular Cliffs of Moher, and the Giant’s Causeway on the northern coast are a testament to the beauty of nature. Other scenic attractions include the secluded and rugged Aran Islands and the one hundred plus mile Ring of Kerry that winds along the craggy coast, past quaint villages in the southwest of Ireland. Any of these can be visited in a variety of ways. There are guided bus tours and car rentals that are available, and many people travel by bicycle. A variety of lodging choices are available, too, from extravagant hotels in large cities to bed and breakfast establishments in small towns and villages. Overall, the wide diversity of attractions, and the ready availability of transportation and lodging make touring Ireland an easy and enjoyable holiday.